1. Introcution to the area 2.Therapeutic Promise of the Eicosanoid Area: An Overview 3. Inhibitors of Eicosanoid production 4. Antiphospholipase Proteins: Introduction and Overview 5. 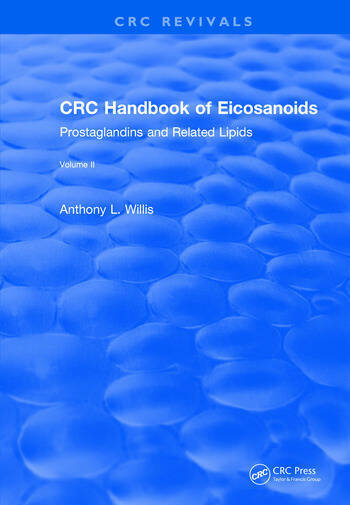 Effects of Corticosteroids on Release of Eicosanoid Precursors 6. Drugs that Inhibit the Activities or Activation of Phospholipases and Other Acylhydrolases 7. Cyclooxygenase Inhibitors 8. Lipoxygenase Inhibitors 9. Selective Inhibitors of Thromboxane Synthetase 10. Modulators of Eicosanoid actions 11. Classification of Prostanoid Receptors 12. Eicosanoid Receptor Antagonists 13. Leukotriene Antagonists 14. Regulation of Cyclic Nucleotide Metabolism in Human Platelets by Prostanoids 15. Opposite Effects of Prostaglandins on Human Platelets Mediated by Distinct Protein Kinases. Index.